In addition to this blog post, I also filmed a video of me making and packaging this soap (how I used the eggs, clay, etc). Hopefully, I will have that finished within the next few days. Like most soap makers, I’ve usually got soap ideas running around in the back of my mind, whether it’s recipes I want to try or ingredients I’d like to test. For the longest time, I’ve wanted to create two soaps in particular: an egg soap and a shampoo bar. The egg soap is mostly out of my own curiosity (and my desire to use my chickens’ eggs for something besides breakfast). And the shampoo bar has been requested by several customers. So, for this challenge, I just decided to combine the two and make a shampoo bar with egg yolks using the cold process method. Lard: A local farmer (and good friend) recently gave me a huge tub of lard. I used it to make soap for his family and all of the people who help out on his farm. I had quite a bit of lard left over, so I was able to use it in the recipe for this soap. The lard does have a strong odor, however, the scent is not detectable in any of my finished soaps. Eggs: I read an article by Anne L. Watson that eggs can be used for different reasons in soap making. The yolks (fat) can help provide a thick, rich lather. The whites (all protein) are used for their astringent properties. Some soap makers even use the whole egg. Because I was making a shampoo bar and wanted help with a thick/creamy lather, I decided to use just the yolks. 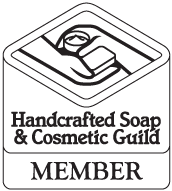 I had also read that an egg smell can sometimes be detected after saponification, but I detect no egg smell whatsoever in my finished soaps. Calendula Oil & Tea: Of all the flowers and herbs I use to infuse oils and make teas for soap, calendula is my absolute favorite. From the beautiful yellow oil it produces, to all of its amazing benefits to the skin, I’m always looking for an excuse to use it in soap. I also read that some people think it’s really good for the scalp and hair, so I felt like it would be great for a shampoo bar. I wanted as much calendula as possible in the soap, so I substituted all of my recipe’s olive oil with calendula infused olive oil and used calendula tea (made with distilled water) for 100% of my liquid. Clay: A few months ago, I ran across a bath and beauty product line that has a rhassoul clay line of hair care products. If you’re interested, it’s called Carol’s Daughter. I had never really thought about using clay in my hair care products. However, rhassoul clay is purported to be quite good at softening and detangling the hair. Well, I’ll take all the softening and detangling I can get, so here’s hoping! I make a shampoo soap that I use on my dogs, so I already had a basic recipe that I liked. However, that recipe uses neem oil (which just stinks), so I changed it up a bit and used the recipe listed below. After the soap cures a bit, I’ll test it out on my hair (along with an apple cider vinegar rinse) and post an update. In my shampoo soap research, I also read a lot of great shampoo bar posts by other soap makers just to see what worked for them. If you’re interested, here’s one by Nerdy Farm Wife and another by Great Cakes Soapworks. Straining the calendula tea – After straining, I stored the tea in my refrigerator overnight. I used it (cold) in this recipe the next day. After straining the calendula oil, I measured and prepared all of my oils & fats, mixed the sodium hydroxide into the cold calendula tea, and allowed everything to cool to room temperature (75º F). After the eggs were completely mixed into the soap, I added the essential oils. I then separated the batch into two equal parts and used the rhassoul clay in one half. I covered the soap with plastic wrap, a lid, and a blanket and allowed it to sit for 18 hours. During that time, the soap went through gel phase. After 18 hours, I unwrapped it and let it sit for another 6 hours before cutting. I cut the 10″ loaf into 3 equal sections, then I cut each section into 2 large bars and 2 sample bars. I ended up with 6 bars and 6 nice size samples. Once I had the ingredients, look, and cut of the soap figured out, I really struggled with the packaging. The only thing that kept coming to mind was a photograph I had taken of the flower garden behind my house. I also wanted to include a photo of my chickens somehow. I finally ended up using Photoshop to combine the two photos into a band that would hopefully brighten up the darker yellow soap. To add some small details, I printed and cut out a few little calendula flowers that my Mom had painted for one of my soap labels a few years ago. I also made a label using a washed out version of the flower photo. After stamping the top of each bar with my smallest soap stamp (the logo didn’t quite all fit, but I like how it turned out), I added some parchment paper and rafia, fiddled with the packaging until I was reasonably happy with something I could repeat, and finally took the photos you see in this post. Whenever I’m challenged with something creatively, I always think of my Grandmother. She was one of the most creative people I have ever known. She could take little things from her backyard like a piece of driftwood, some moss, and a few dried flowers and turn them into a beautiful, award winning centerpiece. I don’t know if my soap is really rustic or country, or if anyone would even want to buy an egg soap with a chicken on the label to wash their hair. Well, anyone but me (I totally would just for the chicken). But I really think my Grandmother would have loved this soap. And she would have loved that I started with some of the little things in my own backyard. Great soap – I didn’t know you could use eggs in soap – I have to try that! I love the packaging too. I love the soap, but I love the story behind the soap even more! Thank you for sharing a bit about yourself as well as your heritage. You obviously come from crafty stock! :) I have yet to try the egg in soap, but it looks like you’ve done it successfully. I also add rhassoul clay to my shampoo bars. I think it’s good! Can’t wait to hear how it works for you! Oh, thanks so much, Amy!! :) I really went back and forth on whether or not to use the rhassoul clay. I’m glad to know you like using it in your shampoo bars. Thanks you so much, Eva! Good luck with your egg soap! Well done Holly, l just love creative people, would love to read hour feed about that soap! Good luck! That is an absolutely lovely soap Holly! …and your Dominique chicken is so cute :-) Thank you for sharing your story! It is so very touching and heartfelt! I love your little hen – she’s so adorable! (Some day we’ll have our own). Your soaps and packaging are beautiful! Thank you for the detailed blog. I have been making shampoo bars for years, but never used egg yolks or Rhassoul clay – now I am intrigued and will have to give it a try! You always make such beautiful soap – I’m so glad you are willing to share your process – thank you!! Very interesting story about the creation of soap !!! I learned a lot of new things about eggs and clay I figured in soap making – thank you !!! Your chickens are prelesny))) Intersnaya idea with the packaging of soap, I like kayim soap came out in the end. I wish good luck in the contest! Thanks again for an amazing post, Holly! Your packaging is incredibly beautiful – and even more so knowing the story behind it. Gorgeously simple, yet stunning soap, too! Side note: this soap jarred my memory of the second soap I ever made – a shampoo bar that I formulated adding some eggs and bentonite clay. Obviously, it didn’t leave much of an impression, lol! Your post has inspired me to re-visit it, though. I’m excited to see your updates on this! Wow! I love everything about this soap. Is sounds and looks divine – That EO blend <3 The colours, the stamp and your packaging all work so well together, and the soap itself; so smooth. Really well done, Holly :) Congrats and all the best in the challenge! Ok :) how was it finally? Hiya, great recipe, must try it, why do you need the vinegar wash after? You may not need the diluted vinegar rinse after every wash, but bar soap will leave a residue on your hair. Over time (and with me – every time), the hair looks dull and feels like it has soap residue on it. The vinegar rinse just helps remove that. Thanks for asking!